Most of can agree that one of the best parts of May are the beautiful blooming flowers. In celebration of the May flowers and my Mother's birthday/ Mother's Day I decided to do a flower wreath cake. 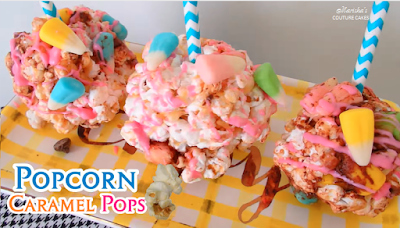 Click to watch the video tutorial. If you haven't yet heard of a flower wreath cake, it's simply a cake decorated with buttercream flowers in the shape of a wreath as seen in the picture. Of course I took it a step further by painting a grassy border for a fun Spring scenery. 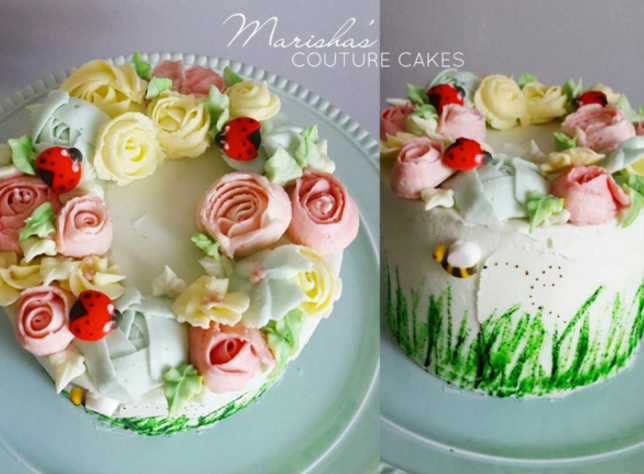 I was inspired by this Months Bakers Box which had baby blue frosting, sugar lady bugs decos, sugar honey bee decos, green fondant and other fun goodies. I started with one big bowl of white vanilla frosting. Color half of the frosting sky blue. 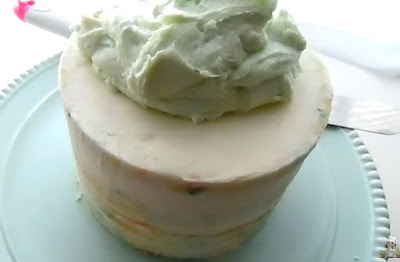 Cover the entire cake in the frosting by starting with a large amount on the top. 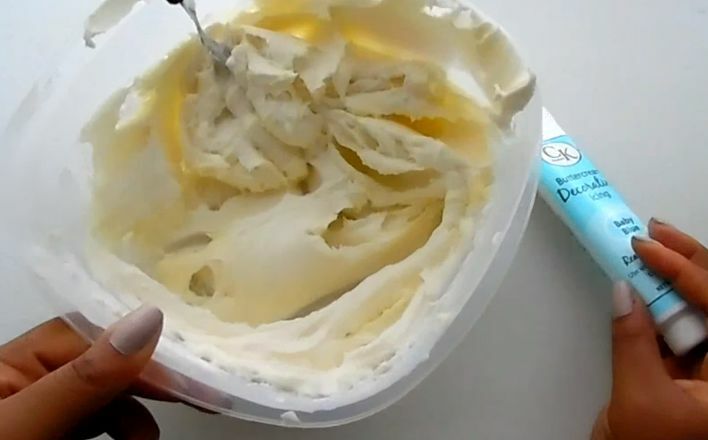 Use a cake decorating spatula or large knife to spread the frosting evenly on the surface in clean swipes. Bring that frosting down the sides of the cake and use the cake scraper for a smooth and clean finish. Refrigerate for at least 20 minutes or until buttercream has hardened. Divide the rest of the frosting into as many colors as you'd like for your flowers. I had a bowl of yellow, red, and the rest of the blue. 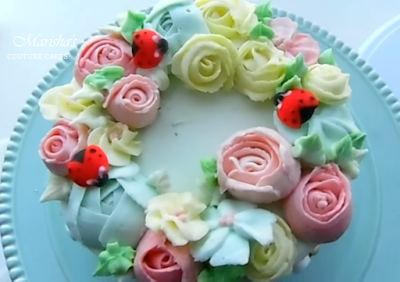 I recommend watching the video above if you've never attempted buttercream flowers. Using these 2 tips give a great variety. Fill the piping bag with the frosting color of your choice. Starting with a petal tip ( there are many, I used #127) always allow for the thick side of the tip to be inward or at times touching the rose nail. The thin side gives the flared edge of the flower which should be outward at all times. 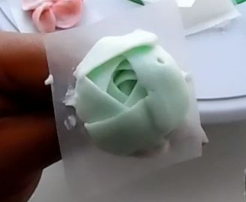 Flower 1: Pipe a small dot of frosting onto the rose nail to attach a square of parchment paper. Start a rose piping a small mound in the center. Pipe one small petal around the mound, bringing it fully to where you started. Pipe another petal the same way and continue turning the nail while piping. Use this method to make the flower as large or small as you'd like. Carefully remove the flower from the nail and set aside. Flower 2: Pipe 2 layers of ruffle petals while turning the rose nail. I piped 3 petals per row. As seen in the top 2 pictures on picture 2. Flower 3: Pipe 5 small petals flat onto the rose nail while turning as needed. 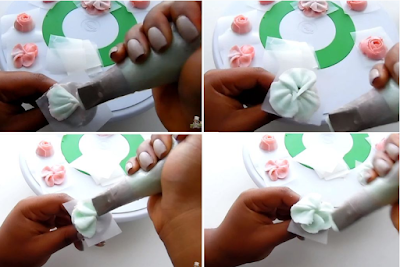 Do this by starting in the center of the flower nail, while piping slightly go outward and bring it back in to the center. Slightly overlap the next petal onto the previous one and continue. Flower 4: Using the same tip (picture 3) make a closed flower by piping a small mound and surrounding that mound with petals. Each petal should be piped inward and not flared out. This is a very easy flower once you have the flow down. Flower 5: Using the #1M tip (picture 4) make a simple rosette flower by starting in the center and piping outward while turning the nail. Flower 6: Use the same tip and hold it directing onto the flower nail. Pipe a small amount of frosting while turning the rose nail. Stop piping and keep slowly turning the nail - pull up quickly to help make that perfect space in the center. Optional: Using other colors and tips, fill in the centers of a few of the flowers. Place all of the flowers in the freezers (10 minutes) or fridge (20 minutes) until completely hardened. Luckily the next few steps are a lot of easier. 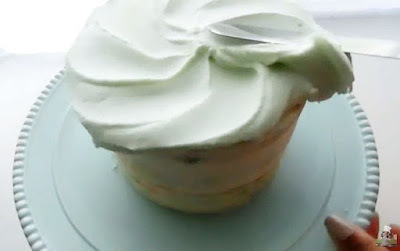 Dip the paint brush into the green gel dye and brush directly onto the cake starting from the bottom and going upward. Make some grass strands darker and some lighter. Paint around the entire circumference of the cake until the grass is thick enough to your liking. Place the candy bees randomly on the sides of the cake. 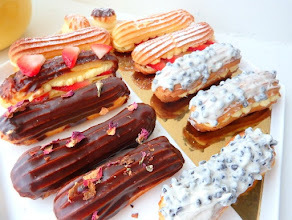 Dip the toothpick directly into the brown gel dye and create a trail behind the bees by dotting a pattern onto the cake. Once the flowers are completely hardened, remove them from the waxed paper and place them around the top of the cake. This should be random. Play around with the placement of the flowers and try not to over think it. I used a couple of shades of green buttercream to pipe a few leaves throughout the flowers to fill in any gaps. Lastly top with the sugar ladybugs and pat yourself on the back. Grab the camera and a plate - you deserved this.